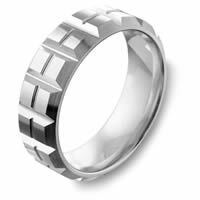 Cobalt Chrome Wedding Ring - Cobalt chrome, 9.0 mm wide, comfort fit wedding ring. The ring has a mix of brushed and polished finishes. Other finishes may be selected. 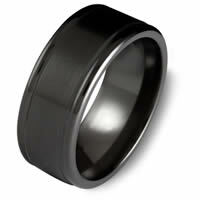 Cobalt Chrome Black Diamond Wedding Ring - Cobalt chrome black diamond, 9.0 mm wide wedding ring. The ring holds 3 round cut black diamonds that are 0.12 ct tw. 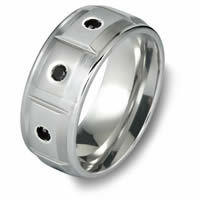 The ring has a mix of brushed and polished finish. Other finishes may be selected. Cobalt Chrome Diamond Wedding Ring - Cobalt chrome diamond, 7.0 mm wide wedding ring. The ring holds one round brilliant cut diamond that is 0.05 carats. The diamonds are VS1-2 in clarity and G-H in color. The ring is brushed in the center and polished on the beveled edges. Other finishes may be selected. 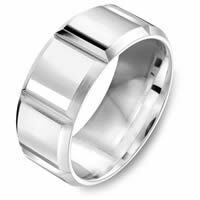 Cobalt Chrome Contemporary Wedding Ring - Cobalt chrome contemporary, 7.0 mm wide wedding ring. 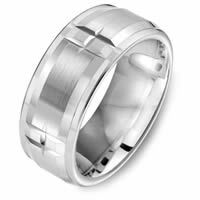 The ring has beveled edges that are brushed finish. The top of the ring is all polished. Other finishes may be selected. 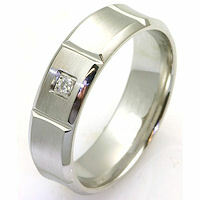 Cobalt Chrome Contemporary Wedding Ring - Cobalt chrome contemporary, 9.0 mm wide wedding ring. The ring has a polished finish. Other finishes may be selected. 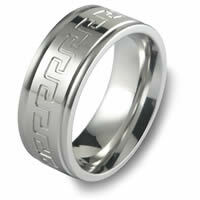 Cobalt Chrome Greek Keys Wedding Ring - Cobalt chrome, 9.0 mm wide, greek keys, comfort fit wedding ring. 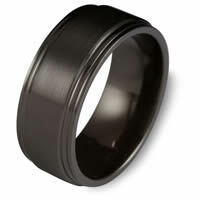 The ring has a mix of matte and polished finish. Other finishes may be selected.